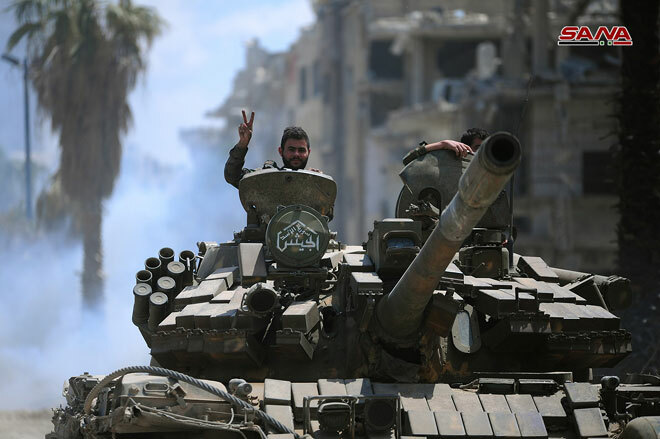 Syrian Arab Army units, baked by the Syrian Air Force, continued on Tuesday the military operation against terrorist groups in the remaining area of the ​​northern part of al-Hajar al-Aswad neighborhood, clearing new buildings in the area from terrorists. News’ correspondent reported that the artillery and air strikes carried out by the Syrian Arab Army targeted terrorists’ fortified positions in the area surrounding Deir Yassin Street in the north of al-Hajar al-Aswad, paving the way for assault units to advance in the northwestern part of the neighborhood. The operation employed cover fire to nullify the effectiveness of terrorist snipers who are making futile attempts to hinder the advancing units. The correspondent said that army units discovered a workshop for producing IEDs and mortars, containing chemicals and highly explosive materials, in addition to a network of tunnels.